As 5G begins its rollout this year across the U.S., 85 percent of consumers expect the increased bandwidth will benefit augmented reality experiences and 80 percent expect greater use of artificial intelligence. That’s the picture from a new survey about 5G from Verizon Media, “The 5G revolution: Excitement builds for advertisers & consumers,” released Thursday. Formerly called Oath, the organization’s portfolio includes Yahoo, Tumblr, AOL, Engadget and TechCrunch, and this is its first survey on the topic. Expecting better experiences, new creative ad formats. While the Verizon Wireless part of this extended corporate family has a vested interest in seeing 5G succeed, the survey’s sample size — 1779 consumers and 295 advertisers — supports the credibility of the findings. 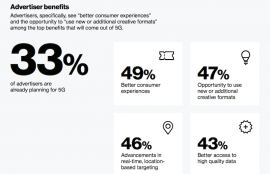 About half of advertisers expect 5G will result in better consumer experiences, new creative ad formats, better location-based targeting and better access to high-quality data, and a third of surveyed advertisers are already making their 5G plans. Several of these survey findings — such as the emphasis on better AR and new kinds of ads –reinforce recent comments made to MarTech Today by marketers contemplating 5G. ‘A quantum leap.’ 5G is the next generation of high-speed wireless transmission and, if the announced specs hold up in the field, it could represent a major transition for digital marketing and advertising. Speeds could hit as high as 10 gigabits/second, a hundred times current 4G LTE speeds, and latency is expected to be very low. “5G is a quantum leap in wireless technology that will bring an era of radically new possibilities across all areas of tech,” Head of North American Sales & Global Client Solutions Jeff Lucas said via email. The survey responses indicate that there’s already a substantial consumer interest in 5G, even though only a handful of pilot efforts have launched thus far. Seventy percent of respondents say they’ve heard of 5G and are familiar with its benefits, including 23 percent of 18 to 34-year-olds who report they are “extremely familiar” with 5G. Forty-three percent of that age group stream video every day, Verizon said, while roughly half of all the respondents in the Verizon Media survey said they are anticipating high definition video on wireless devices, better video streaming, better connectivity for wearables and fewer dropped calls. Why you should care. With all the major carriers expect to launch 5G this year in the U.S. and elsewhere, and many 5G-enabled smartphones getting ready for release, the new wireless technology could have a major effect on digital marketing and advertising. It might, for instance, eliminate the need for cable TV or cable-delivered Internet, at least in non-rural areas, and thus could change the structure of the cable TV ad industry. At speeds as high as ten gigabits, it essentially makes 4K-quality video available wirelessly, could make high-resolution augmented reality layers commonplace, and will make the highest level of artificial intelligence accessible to any vehicle or device. Assuming the technology performs as advertised, the key question, then, is whether consumers and advertisers will find 5G compelling. This study is one of the first to indicate the answer is yes.